When you say 'Hi' to a Moroccan these days, he/she will answer 'it's freezing'. When you ask him/her 'how are you', he/she will tell you 'I'm cold'. When you want to find out about 'where they have been these days', they will answer: 'in bed, covered with dozens of blankets, coping with coughs, and bad flu'. It sounds as though Moroccans lost their minds with the freezing temperature prevailing in North Africa. The experience shows that Moroccans can not stand cold weather. It is the first time many Moroccans have ever experienced freezing weather. Last Saturday, Casablanca recorded -1C (30F), several degrees below its average minimum. 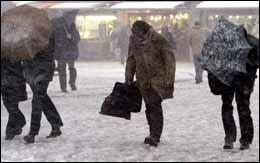 Sales of blankets, jackets, coats, and scarves topped this week, as many Moroccans went to shopping centres to buy warm clothes. Leila, 40, a mother of four children, said that “everybody at home is sick”. She added that her sister, who lives in Canada, used to come during winter time to Morocco because she can not stand freezing weather. “And now she has to put up with this 'icy weather',” she said. Mona, 30, a chemist in the shopping centre's pharmacy, told Morocco Times that most patients who came these days to buy medicines suffer from flu and bad colds. Sounds of sneezes and coughs are invading Moroccan streets and homes. You hear them at work, in the train, in coffee shops, in conferences, at home, everywhere. Even in public phone boxes, most telephone conversations are about cold weather, flu and medicines. Words like “Smikli”, “Sam”, “Bard”, “Asamid (in Berber)” (different names describing cold weather) are also commonly used. Some even call it “mout”, which refers to death. People in Morocco's remote village are currently cut off by heavy snow heaps which has paralyzed traffic and blocked roads. Naughty boys chatting up girls in the street are using freezing weather expressions to open a conversation. This cold weather is an unusual event in most of Morocco. It is total hysteria, Moroccans do complain whether be it cold or hot. The experience showed that Moroccans are so "fragile" that they can't stand a below -1C, which is normal in winter times in European and North American countries. In neighbouring Algeria, the situation is even worse. The heaviest snow in more than 50 years has fallen on the Algerian capital, paralyzing traffic, killing more than 13 people and isolating nearly a third of the North African country's provinces.